McLaren Speedtail: hypercar makes 309bhp from its e-motor alone! When we previewed McLaren’s astonishing low-drag, three-seat Speedtail, powertrain details were thin on the ground – Woking refused to even confirm that its trademark twin-turbo V8 was under that streamlined engine cover. The McLaren Speedtail has finally arrived, and it’s a £1.75-million carbonfibre dart, capable of a McLaren F1-beating 250mph top speed. 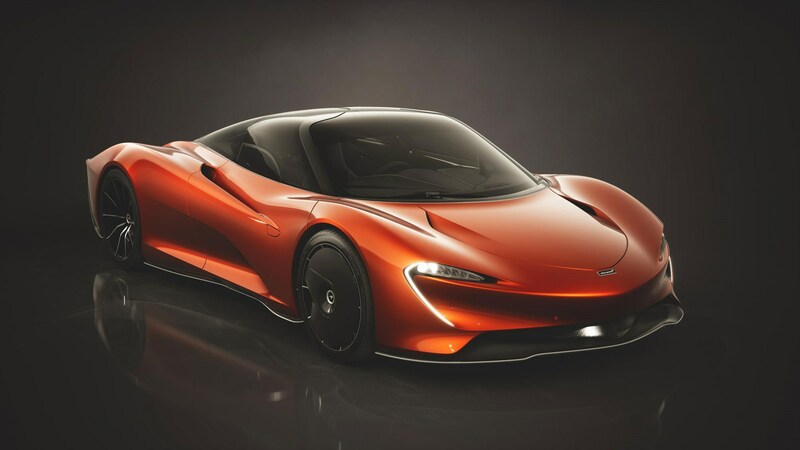 Unveiled today after months of teasers and a drip feed of performance specs, the new car is clearly a spiritual successor to the record-breaking McLaren F1 of ‘94, and the first model of the company’s new Track 25 business plan. McLaren has been surprisingly tight-lipped about the petrol-hybrid powertrain inside the Speedtail (we’ll get to that later), but the most striking thing about the new hyper GT has to be its elongated, streamlined looks. At 5137mm, or 17 feet in old money, the new Speedtail is more than half a metre longer than the P1 – but narrower – and every square inch is designed to minimise drag and maximise V-max. 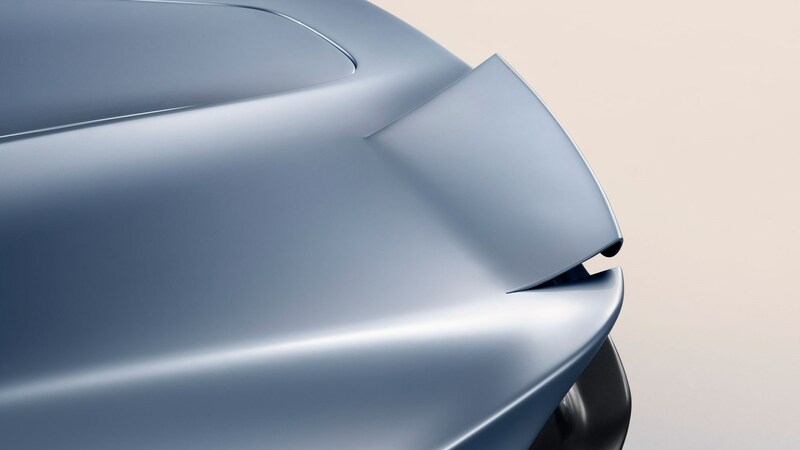 The front of the Speedtail looks like a squinting version of the usual McLaren ‘face’, as ducts and air intakes have been narrowed to reduce drag. 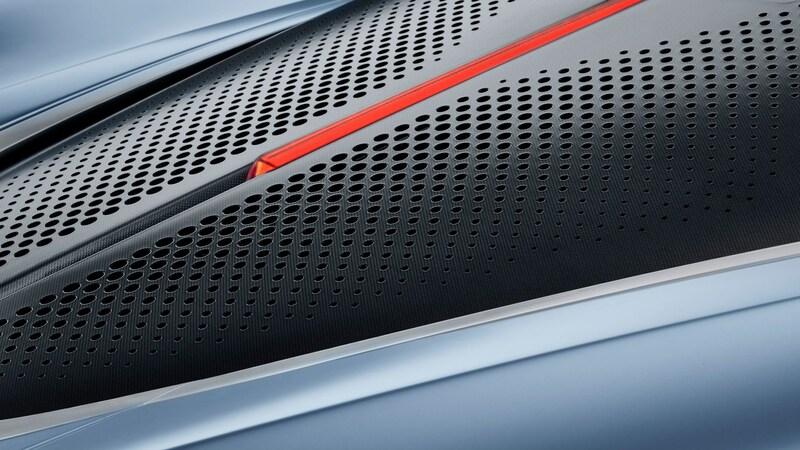 Starting with the sculpted front splitter, McLaren has used all five metres of the car to fold, tuck and direct airflow on the path of least resistance. Inlets at the front of the car ease air through the sides of the Speedtail, around wheel arches and through door vents. And even engine air-intakes – situated behind the glass canopy – melt gradually into the bodywork to stop airflow separating from the car’s surface. 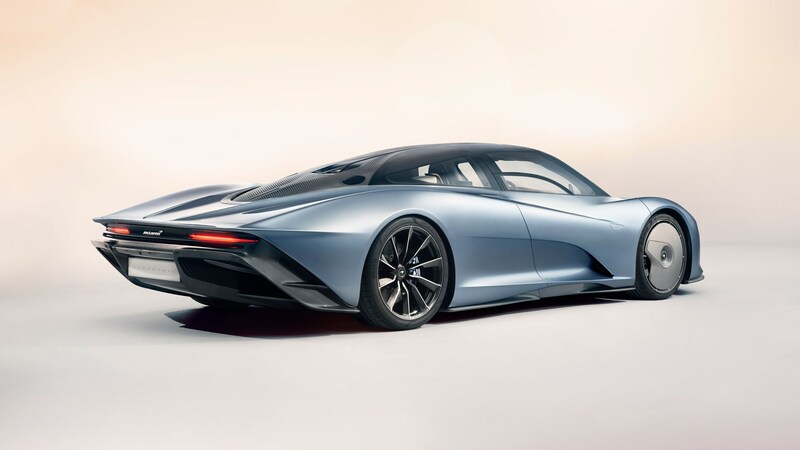 The Speedtail lives up to its name at the rear, and features extended rear bodywork to improve aerodynamic efficiency even further. 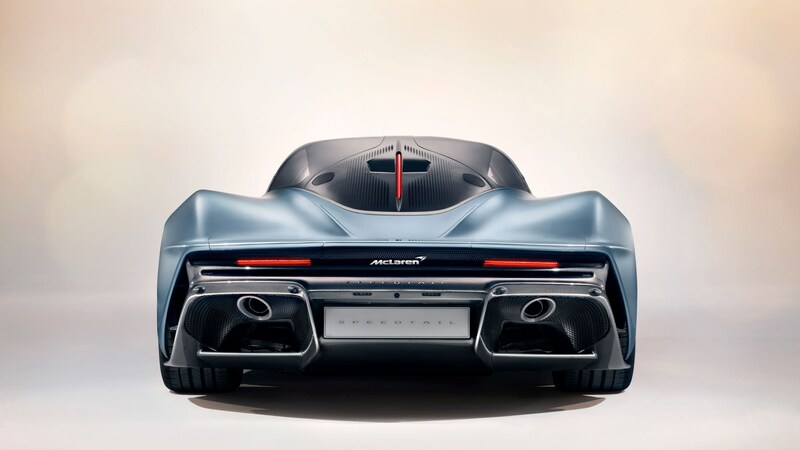 Unlike a more abrupt design, McLaren says the back of the Speedtail cleans up air flow and draggy turbulence, allowing for a higher top speed. Underneath, rear blades smooth airflow either side of a large, lengthy diffuser, while on the top surface of the car, movable ailerons work to generate the optimum level of downforce at any given time. Interestingly, those ailerons don't have seams either, and actually bend the flex the Speedtail's carbonfibre bodywork. The result? No panel gaps means minimum air disruption. 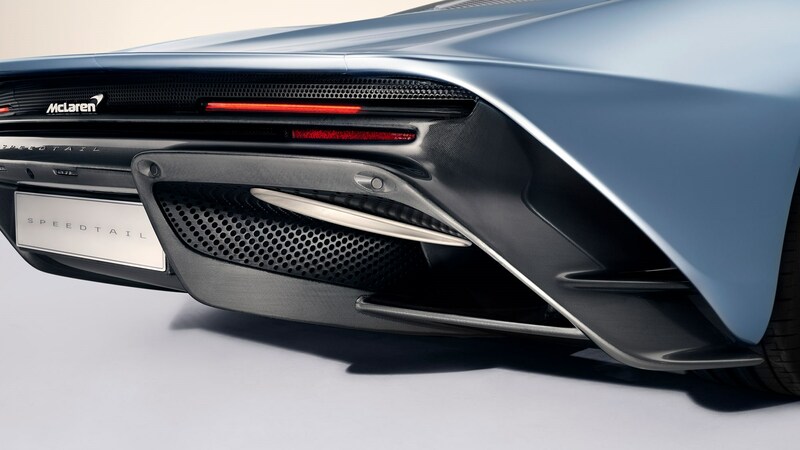 McLaren engineers have used a handful of innovative techniques to reduce the weight and turbulence of the new Speedtail. 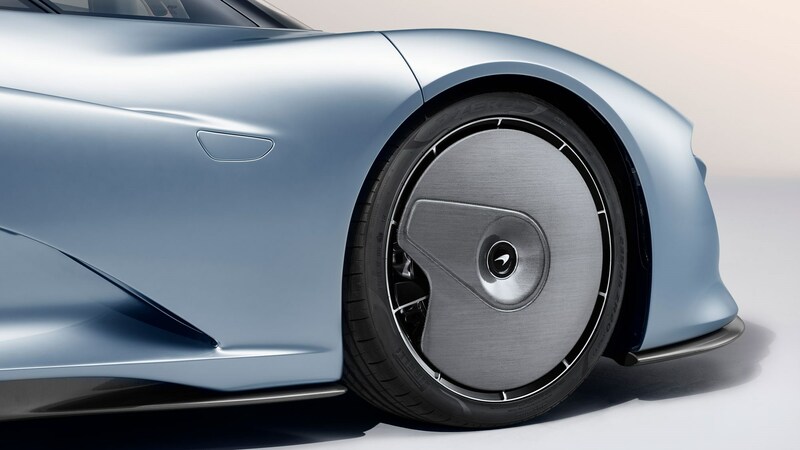 At the front-axle, carbonfibre shrouds – reminiscent of 2009 F1 cars – cover the 20-inch, 10 spoke wheels, limiting the aero effect they cause – and the Speedtail borrows an idea off the forthcoming Audi e-Tron too. 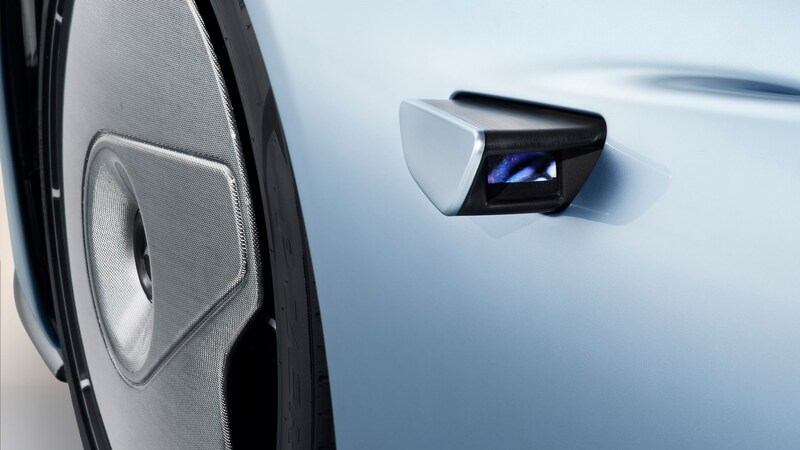 Just like Audi’s electric SUV, the McLaren Speedtail offers electric cameras instead of conventional door mirrors, reducing drag around the sides of the car. 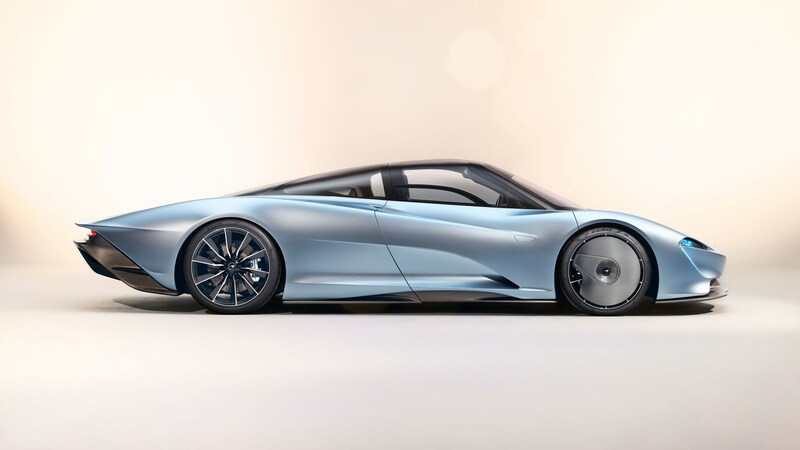 In Velocity mode – which also lowers the car by a 35mm to just 1120mm at its highest point – the cameras slot back into the car, reducing the aerodynamic wake of the Speedtail even more. 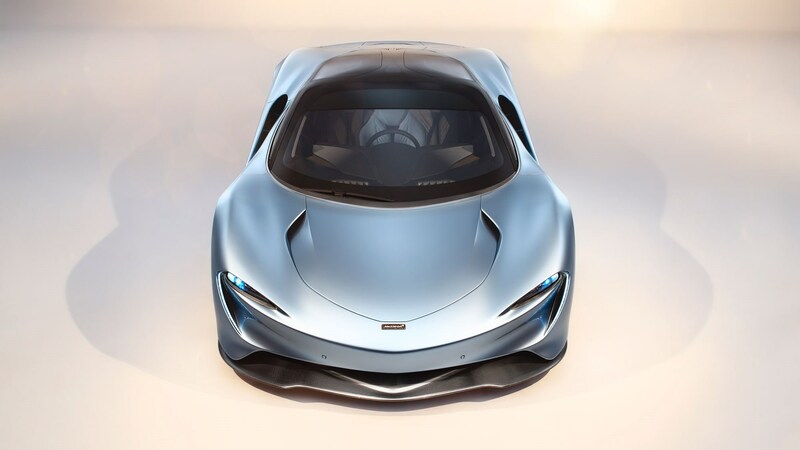 As you’d expect, the Speedtail uses carbonfibre monocoque and lighter 1K Titanium Deposition Carbonfibre body panels to weigh in at just 1430kg without fluids, but McLaren has shaved off the grams in more subtle ways, too: electrochromic glass darkens the top of the windscreen, removing the need for sun visors, and the same technology is applied to the upper section of the doors, the porthole and the rear rear-quarter lights. That’ll be worth about 300g at least, right? McLaren is offering a bespoke luggage set to all 108 owners, that’ll match the spec of their chosen interior. The McLaren Speedtail may be the first ‘hyper GT car’ the Woking-based firm has ever made, but inside it borrows the ideas of the McLaren F1, and executes them with the switchgear and style you’d find in a contemporary McLaren. The much-mooted three-seat configuration is here, too – with the driver’s chair edged further forward, of course – and most of the car’s instrumentation is digital. All the other switchgear is fashioned from polished aluminum, and the engine start button – as well as the switch for the car’s velocity mode – is found on the ceiling of the teardrop-shaped cockpit, above the driver’s head. Amongst all the hand-stitched leather and bespoke materials, McLaren has also introduced ‘directional’ leather that should allow occupants to easily slip into the car, but be gripped when actually driving. It’ll be interesting to see how that works. Deliveries will take place in Q1 2020. Customers on the list of 106 will be able to choose from three broad collections or looks – each containing at least three further variations. 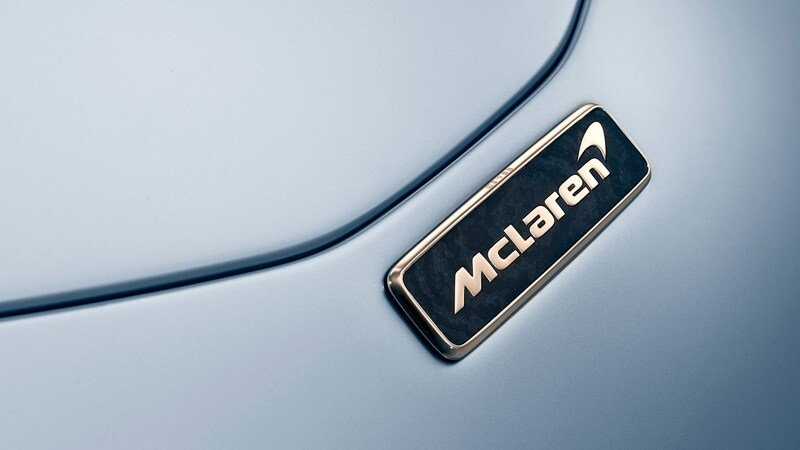 While every aspect of the car’s look can be easily personalised, McLaren thinks this theme and collection set-up will take much of the hassle out of ordering and speccing their new supercar. Think lots of navy blue, orange and bits of silver – and you’re pretty much there. Oh, and a white gold, 18-carat badge. Dynamic appears to be the most showy, Instagram-friendly collection, and is probably best represented by the Bloodline theme. As you can tell from the name, it’s all bursts of red and gloss black with bits of copper and white thrown in - you can check the Bloodline interior above. We think our pick would be the Urbane collection. McLaren Speedtail: when's it coming out? Testing for the spiritual successor to the F1 is already underway. According to a new update from the Woking-based firm, closed-testing of a Speedtail prototype has already begun, with road-testing to kick off in January 2019. As you’d expect, the testing programme will encompass a range of different conditions, and will therefore see Speedtail prototypes running in Europe, North America and Africa – both in closed and public conditions. 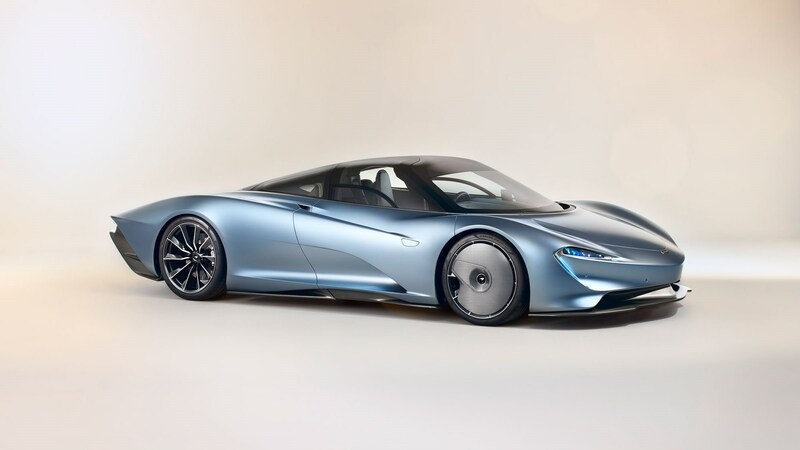 McLaren will also be using the testing time to help customers give feedback on the Speedtail’s handling – which is rather unusual. McLaren will start off with the prototype pictured above. Called Albert, the mule features special testing livery, but will be pretty much identical to the production car in every other way – and uses the same as-yet-undisclosed petrol-electric powertrain. As for the name? The original McLaren F1 was also called Albert, and that was named after the Albert Drive premises in which the 1992 supercar was designed. ‘The start of real-world testing represents a major step in the development of the McLaren Speedtail.’ said McLaren’s head of vehicle development, Ben Gulliver. ‘As the first fully representative prototype, ‘Albert’ will build on the invaluable work still being put in by earlier development cars, allowing us to sign-off vehicle attributes including chassis dynamics; brake performance; damper tuning; tyres; NVH and aspects of ergonomics and comfort.